CDC: "Don't kiss your birds or snuggle them and then touch your face or mouth." Louisiana resident Stephanie Morse treats chickens like family, and like any other family member, Morse’s chickens get costumes every Halloween. "Their bare skin is exposed, I just like to put a sweater on them to keep them warm and comfortable, and some of them have more personality," Morse told CBS affiliate KNOE-TV. 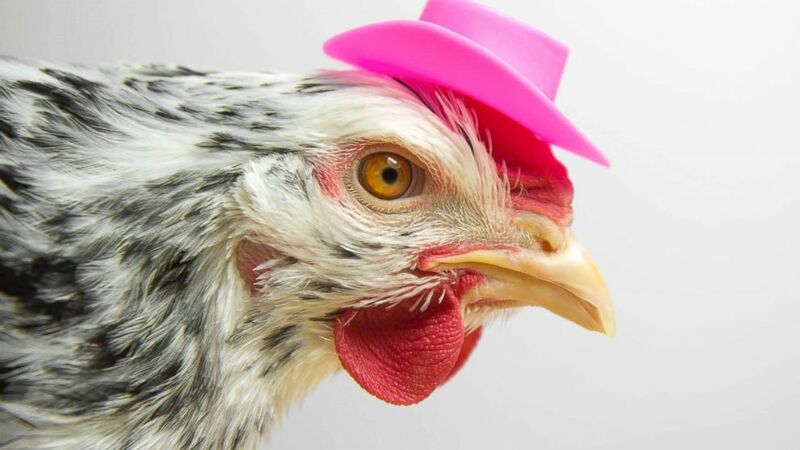 (STOCK/Getty Images) A chicken wears a cowboy hat in an undated stock photo. The CDC warned that people could be infected by handling live chickens. Additional guidance includes: •	Always wash your hands after touching chickens or anything in their environment. Running water and soap are best. Use alcohol-based hand sanitizer if soap and water aren’t available, and wash your hands thoroughly when you get to a sink. •	Keep chickens outdoors. Never bring them in your house. •	Don’t eat or drink in the area where the birds live or roam. •	Don’t kiss your birds or snuggle them and then touch your face or mouth. •	Children under 5 years old should not hold or touch chickens. Young children are more likely to get sick because their immune systems are still developing and they are more likely to put their fingers or pacifiers and other items into their mouths. Editor's Note: This story has been updated to clarify that the Centers for Disease Control and Prevention advises pet chicken owners to handle the animals carefully to keep themselves and their households and healthy. A previous version of this story incorrectly summarized the agency's guidance as pertaining specifically to Halloween costumes.